The Fishpond Cirrus Guide LTE has all of the features I liked on the Waterdance; but it comes in a smaller and lighter overall package. You still get the convertible waist and shoulder sling, double drink holders, removable front fly patch, burly zippers and accessory attachments. A year later I can comfortably say that the Cirrus LTE will hold everything you need for a day of fly fishing. 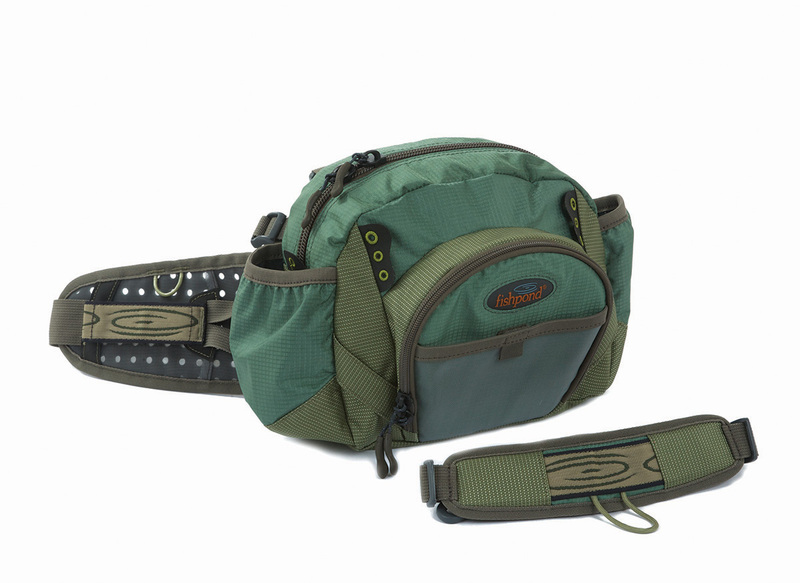 If you run out of room with this pack you might want to ask yourself: “do I really need 7 flyboxes for the Eagle River today?” Fishpond’s Cirrus LTE has two compartments, the large main pocket with a zippered inner pocket and a smaller front pocket. I have found that the zippered pocket in the main compartment is perfect for items that you rarely need but always carry (small first aid kit, nail knot tool, etc…) The main compartment will accommodate up to 6 small to medium fly boxes. Personally, I always remove the fly patch (perfect for sticking on the dash of your fishing rig,) and keep all of my accessories that don’t live on my lanyard in the front pocket. True to any Fishpond product, my Cirrus LTE has held up very well under all kinds of abuse while fly fishing in Colorado. The thing that has impressed me most with this pack is that when traveling I end up using it not just for fishing stuff. For example, this pack was perfect on a recent steelhead trip where I only needed one fly box but I ended up hiking a bunch. The LTE comfortably accommodated two water bottles, tips, and extra layers perfectly. I you are looking for something versatile and compact, the Cirrus LTE deserves strong consideration.